Joel Embiid didn’t watch Game 1 from the bench like many feared, he was peeking at Amir Johnson’s cell phone instead. 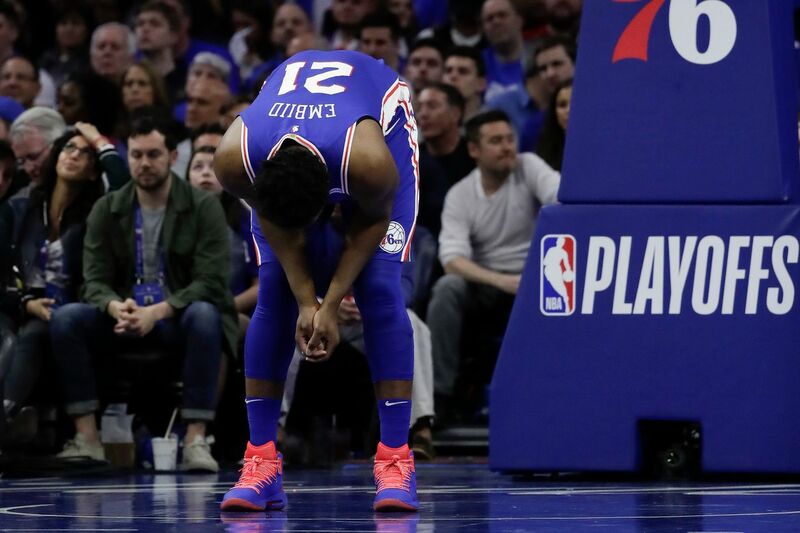 The boos rang down as early as the first quarter and continued even as the Wells Fargo Center patrons began to file for the exits in the fourth. D’Angelo Russell had 26 points, Caris LeVert added 23 off the bench and the Brooklyn Nets led by as many as 17 in a dominant 111-102 victory over the Philadelphia 76ers. It’s a starting five that had only played 10 games together and the lack of cohesion has showed. While talent may normally trump all, the Sixers haven’t had enough time for all of it to mesh together. The team defense isn’t there, the ball movement isn’t necessarily crisp, they need time to incorporate everyone together, but it’s time the Sixers simply don’t have. Attempting to build cohesion on the fly and win playoff games is difficult to do as evidenced by Saturday’s lackluster performance. And this is utterly unacceptable. Here was head coach Brett Brown’s response to the incident. Embiid responded by saying that Johnson’s daughter was extremely sick and they were checking on her well being. Jimmy Butler was the lone bright spot for Philly, netting 36 points. He was relentless in his pursuit to the basket, going 11-of-22 from the field and 13-of-15 from the foul line. He knocked down a 3-pointer at the first half buzzer to get the Sixers within eight, 62-54. Sore knee and all, Embiid drew a lot of fouls inside and went 12-of-18 from the charity stripe, but finished with 22 points on just 5-of-15 shooting. He also missed all five of his attempts from beyond the arc. The Sixers led 17-15 before the Nets closed the opening frame on a 16-5 run to take a 31-22 lead. Philadelphia was 6-of-25 from the floor and 0-of-9 from beyond the arc in the first. Russell’s 3-pointer at the 8:24 mark of the second staked Brooklyn to a 44-27 advantage before it rolled into the locker room with its eight-point cushion. An Embiid bucket clawed the Sixers within 65-63 at the 9:51 mark of the third, but back-to-back buckets by Russell capped a 6-0 spurt to increase the margin back to 71-63 and Brooklyn headed into the fourth with a 93-82 advantage. Philadelphia was never able to whittle the deficit below nine in the fourth.